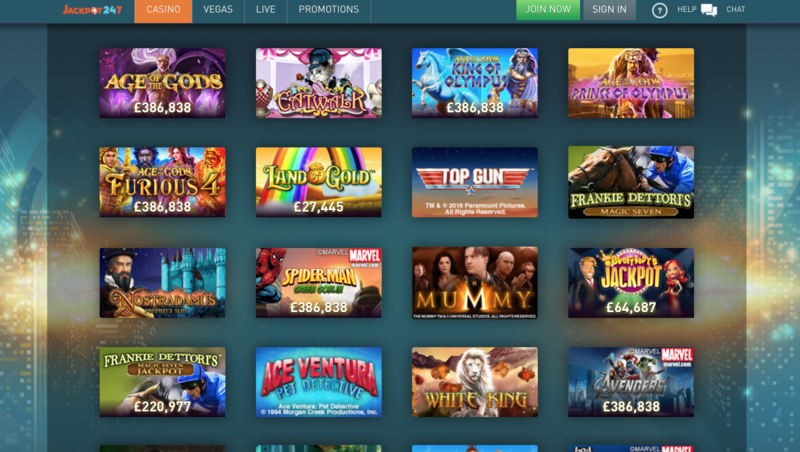 It’s likely that the name Jackpot247 is familiar to you, as, along with its NetPlay brethren SuperCasino, the brand is the leading TV gaming operator in the UK. However, success in one aspect of the industry does not guarantee it in another, as we’ve seen proven many times by brands that attempted to expand online from other parts of the industry. This means that, despite Jackpot247 having a level of prestige around it that other new online casino sites could only dream of, this is a site that has still had to work its very hardest to ensure success in the highly competitive iGaming market. In fact, it’s possible that many online gambling fans will look down on a TV gaming brand due to the somewhat cliché way that they tend to operate. Many are chasing originality in the iGaming world these days, and the truth is, Jackpot247’s TV presence does not provide any. That’s what makes it so interesting to see what direction Jackpot247 has chosen to go in, is this an extension of the predictable yet popular television presence, or has the brand embraced the world of online casino play and gone in an entirely different direction? If you were hoping that the second of those options was true, then you have probably given a little too much credit to the creative abilities of those behind Jackpot 247, because what you get here is the closest it’s possible to get to the TV product design, while still actually functioning as an online casino. 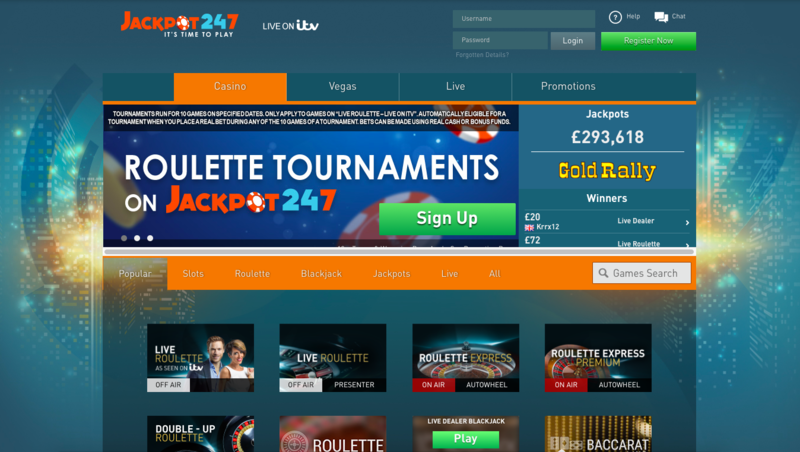 The blue and orange colour scheme and familiar logo is to be expected, but even the thumbnails on the homepage make it clear that this is a site that is riding the popularity of its TV games, with most of the thumbnails taking you to an “As Seen on ITV” live dealer game. It’s actually quite nice to find a site that focuses more on table and card games, and especially live dealer options, than it does on slots, and if this felt like it was done for any reason but the fact that it’s what the Jackpot247 TV shows are known for, we’d probably be impressed. Navigation is simple enough here, but this is a brand that is too big to be congratulated for simply creating a site that isn’t hard to use, Jackpot 247 could have taken a risk here, and produced something different and impressive, but they did not do that, not to a startling degree. There are more than just the live dealer games that echo the television options here, but not by much, with a frankly disappointingly short list of software developers that includes just four names, GW Games, IGT, Playtech, and Quickspin. That isn’t to say that these are bad names, in fact, they are some of the best around, there just isn’t enough of them. When you’re missing the likes of Microgaming, NetEnt, NextGen, and Yggdrasil just to name a few, then it’s going to be hard to compete with the plethora of different online casinos that offer those names and many more. It’s like Jackpot247 simply expected their name to guarantee them success in the online casino world, and did not give the necessary amount of respect to how competitive the industry is, or the quality of the sites which have managed to become established and carry a strong reputation. Jackpot247 is likely to tempt in a few players because of its name, and it’s still got its television gaming audience, but as an online casino, this is a really poor effort.